Thailand's anti-corruption protesters appear to have lost faith in the key tenet of representative democracy: rule by people or parties elected by the majority of citizens. For many on both sides, it is no longer a question of if but when this deep-seated civil conflict descends into outright civil war. With popular singers belting out Queen’s “We are the Champions” and John Lennon’s “Imagine,” the enormous protests taking place against Thai Prime Minister Yingluck Shinwatra’s government have all the cultural luster of a progressive cause. Professional and highly educated people crowd the streets, and young people shout passionately against corruption. Middle class liberals around the world easily find much they can relate to. But one thing about this movement bothers liberal analysts, including quite a few in the foreign press. The protesters appear to have lost faith in the key tenet of representative democracy: rule by people or parties elected by the majority of citizens. While no one denies that Thailand’s political system needs reform, many observers feel that the opposition has rejected the elections not simply as a protest against corruption, but rather because it knows it will lose the vote — just as it has lost the last five parliamentary contests. The current showdown between the Pheu Thai government and the opposition is but the latest round in an epic struggle between conservative and populist forces that began when Thaksin Shinawatra, brother of the current leader Yingluck Shinwatra, became prime minister of Thailand in 2001. Thaksin came to power in the aftermath of the Asian financial crisis of 1997. That crisis saw over a million Thais drop to the ranks of the poor when what had been one of Southeast Asia’s most dynamic economies collapsed due to capital flight, followed by an austerity program imposed by hapless governments under the thumb of the International Monetary Fund (IMF). Thaksin had benefited from globalization owing to his massive holdings in private telecommunications, one of the economy’s most globalized sectors. Yet, with unerring populist instinct, he sensed that the financial crisis had catalyzed popular fears about free-market globalization, smoldering resentment toward the urban and rural elites that seemed to be cornering the country’s wealth, and anger at the international financial institutions. On becoming prime minister, Thaksin made a number of dazzling, if opportunistic, moves. He paid off the country’s loan and kicked the IMF out of Thailand. He initiated a universal health care system that allowed people to be treated for the equivalent of a dollar. He imposed a moratorium on the payment of farmers’ debts. And he created a one-million-baht fund for each village, which villagers could invest however they chose. This side of Thaksin won him a mass following among the country’s deprived and marginalized sectors, entrenching him and his coalition in the northern and northeastern regions of the country. But there was another side to Thaksin, a side that most of his urban and rural poor followers chose to ignore. Thaksin literally bought his political allies, constructing in the process a potent but subservient parliamentary coalition. He used his office to enhance his wealth and that of his cronies. He failed to distinguish public interest from private gain. And he gave short shrift to human rights concerns, most notably by backing a police campaign against drugs that resulted in the extra-judicial executions of over 2,000 people. Like many others with overwhelming power in their hands, Thaksin overreached. One move in particular galvanized the opposition. When he got the Revenue Department to exempt from taxes the sale of his family’s controlling stake in a telecom conglomerate, Bangkok’s enraged middle class took to the streets to demand his ouster. Feeling mortally threatened by Thaksin’s effort to redraw the landscape of Thai politics, the Thai establishment jumped onto the anti-corruption bandwagon. Unable to break Thaksin’s parliamentary majority or to achieve a critical mass in the streets to sweep him from power, the elite pushed the army to oust him while he was out of the country in September 2006. The military-installed government that took over performed miserably. Following its exit, a pro-Thaksin coalition came to power through elections. When a court order dissolved that coalition, parliamentary maneuvers resulted in a fragile governing alliance cobbled together by the minority Democrats, with Abhisit Vejjajiva at the lead. Subsequently, Thaksin’s supporters (called the Redshirts, in contrast to the anti-Thaksin Yellowshirts) amassed followers nationwide and marched on Bangkok early in 2010. The tragic street confrontations that followed climaxed on May 19, when the military broke up Redshirt barricades in downtown Bangkok. Numerous people were arrested and many others died, and buildings, including the huge Central World mall, went up in flames, allegedly set on fire by the Redshirts. Under fire for allegedly giving the green light to repressive actions, the Abhisit government was voted out of office in July 2011. A coalition led by the Pheu Thai party replaced it, and Thaksin’s younger sister, Yingluck, became prime minister of Thailand. Yingluck has been widely seen as a stand-in or puppet for her brother. Living in exile in Dubai since courts convicted and sentenced him in absentia for corruption, Thaksin is considered by many to be ruling from afar. Perception turned into protest when Yingluck’s government tried to push through an amnesty bill to forgive all those charged in connection with the bloody 2010 street protests. Although it would have affected both the anti-Thaksin and pro-Thaksin sides, the opposition considered the bill a ploy to allow Thaksin to return to the country without serving out his jail term. This was confirmed when, in an early morning parliamentary maneuver, the ruling coalition rammed through a provision that would extend the amnesty back in time, ten years before 2010. With the Bangkok middle class angrily taking to the streets, Yingluck retreated and told pro-government senators in the Senate to withdraw support for the bill. But it was too late. Bangkok has always been an opposition stronghold, and civil protest — led by Suthep Thaugsuban, one of the top leaders of the Democratic Party — escalated. By mid-December, demonstrators numbered in the hundreds of thousands. What had started out as an anti-amnesty movement transformed into a movement to oust the government. 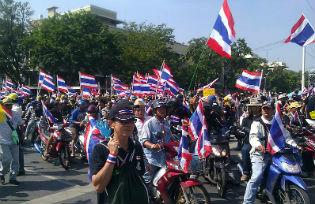 At first, the protesters focused on staging rallies at the historic Democracy Monument in downtown Bangkok. Later they moved on to shutting down government offices. This tactic made the government appear besieged and unable to function — a perception reinforced when opposition Democrats resigned en masse from Parliament. Yingluck responded by dissolving parliament in mid-December and setting new elections for February 2. Sensing it had momentum, the opposition called for a boycott of the elections, insisting that Yingluck step down and make way for an unelected council to formulate reforms. To give muscle to these demands, the opposition launched a campaign to “shut down Bangkok,” targeting government buildings and occupying key intersections downtown. The shutdown has triggered a tailspin in the country’s economy, although it has not succeeded in getting Yingluck to resign. The opposition’s stand against elections has deepened divisions in Thailand’s liberal and progressive community. Kraisak Choonhavan, an ex-parliamentarian and a pillar of the human rights community, sees non-participation in the coming elections as justified by the effort to achieve “total reform” of the electoral system before holding elections. “Every democracy needs such a period of reform,” he contends. To people like Thirayut and Kraisak, extraordinary means must be taken to rescue Thailand from what they consider the all-pervasive corruption of the country’s institutions by the Shinawatra family. Although the situation remains murky, one thing is clear: both sides of the political divide defy simplistic characterizations. The protesters are not simply tools manipulated by traditional political and economic elites who see Thaksin as threatening their interests, as some pro-government analysts have characterized them. Most see themselves as participants in a grand crusade against corruption. On the other hand, most of the masses that have brought the Redshirt coalitions to power have not been bought and corrupted by Thaksin’s money, as they are portrayed in anti-government speeches. They really do feel that they are fighting to save democratic rule and economic justice from being destroyed by reactionaries. While the protests have so far remained largely non-violent, instances of violence, including recent reports of people throwing grenades, portend another bloody dénouement like May 2010. Some pro-government sources think the PDRC strategy may be to provoke the military to intervene, in order to oust Yingluck and impose Suthep’s unelected reform council. The military is hesitant to get involved, given the terrible experience it had governing the country after the 2006 coup. Even after the government declared a state of emergency on January 21st, the military has been extremely careful not to crack down on the protesters, despite their efforts to prevent early voting by blocking polling stations. But tensions are rising, and another putsch is not out of the question. The king, who has long been regarded as a moderating force in Thai politics, will also probably not intervene. Old and ailing, King Bhumibol is no longer in as good a position to act as he did in 1992, when he brought opposing figures together to put an end to military repression of pro-democracy protests. With no third force to break the deadlock, there is no prospect in sight except deeper and sharper polarization. If Yingluck is ousted, the Redshirts may well invade Bangkok. Alternatively, the February elections may take place and put another Pheu Thai government in power. But this will not end the opposition’s refusal to grant legitimacy to any Thaksin-led government — nor will it stop the opposition from using all of its middle-class muscle to try to oust it. For many on both sides, it is no longer a question of if but when this deep-seated civil conflict descends into outright civil war. Walden Bello represents the Akbayan Citizens’ Action Party in the Philippine House of Representatives. He was the principal author of Siamese Tragedy: Development and Degradation in Modern Thailand (London: Zed, 1998) and is the former director of the Bangkok-based Focus on the Global South.